but we have seen them. but the rest we fill in." The Screen Above is the latest performance I've put together, and we pulled out all the stops for this one. Here's the trailer, and if you're in the NYC area, it's playing Wednesday February 27th for one night only. Roulette Presents: The Screen Above from Josiah Cuneo on Vimeo. LILT wins Best Experimental Film! Congratulations to everyone who worked on the the film LILT, it was announced today that the film won the award for Best Experimental Film at the Festigious Film Festival LA! The film was also nominated for Best Actor Ben van Berkum and Best Score at the UK film award festival Monkey Bread Tree Film Awards. 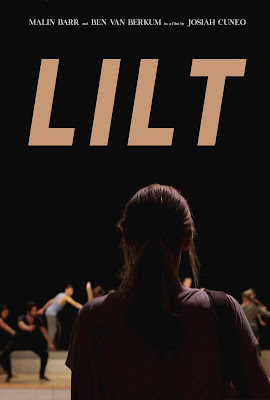 Lilt (trailer) from Josiah Cuneo on Vimeo. 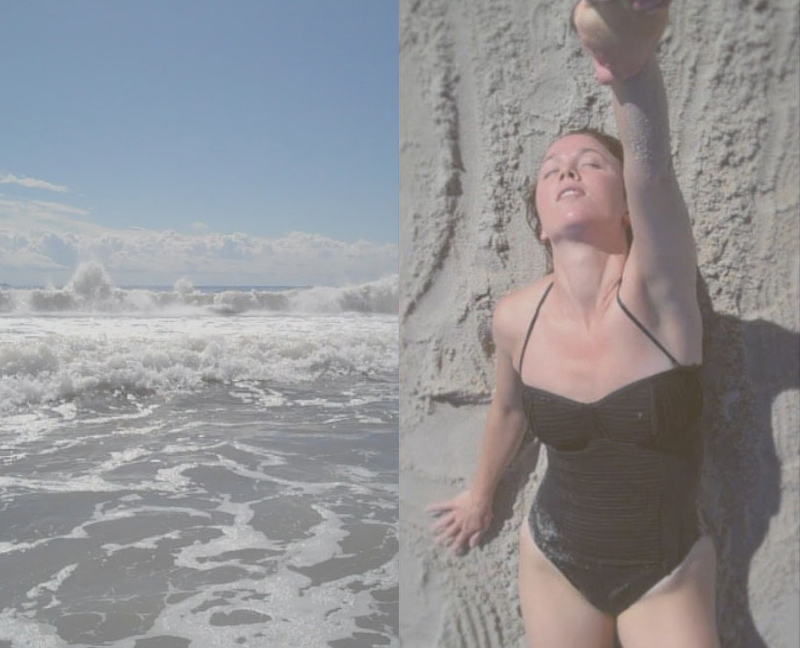 Friday February 10th I'll be showing a one night site specific film and performance at Roulette Intermedium. 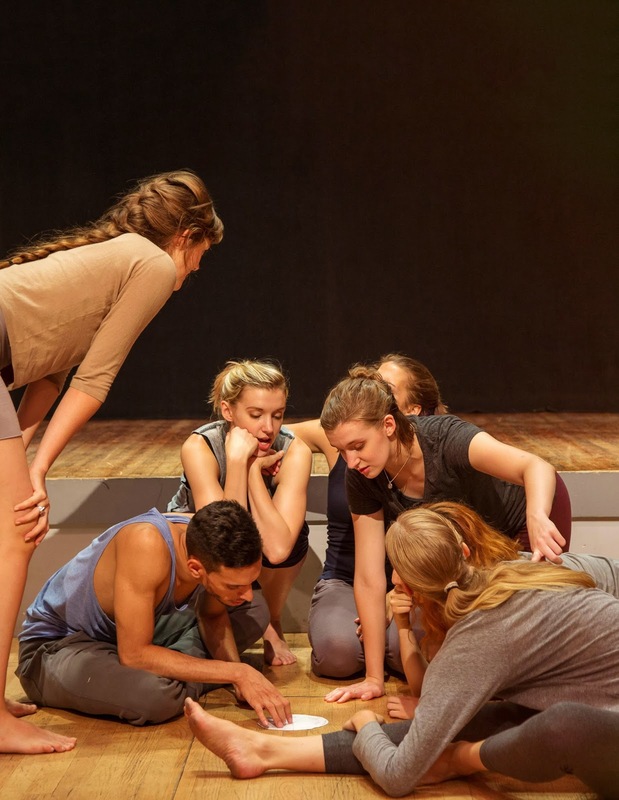 The product of collaborating with over twenty performers over the past two years, it will will be a very special night made possible through The Jerome Foundation and Roulette's Artist in Residency Program. 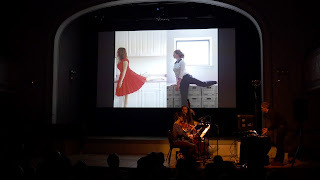 I will be screening a film at the upcoming night of dance films Long Legs, Short Films, Friday June 19th. Join me on Wednesday May 20th for a screening of my short film In Through the Night at Anthology Film Archives, New York. It is part of the 2015 NewFilmmakers Screening Series, which I am proud to be part of. On Saturday April 25th I'll be showing a short film I made with artist Anna Moser as part of the exhibit Light Soluble Mediums at The Picture Show in Brooklyn. It is being put together by Organism for Poetic Research. It will be the last screening at The Picture Show, so come out if you've never been. 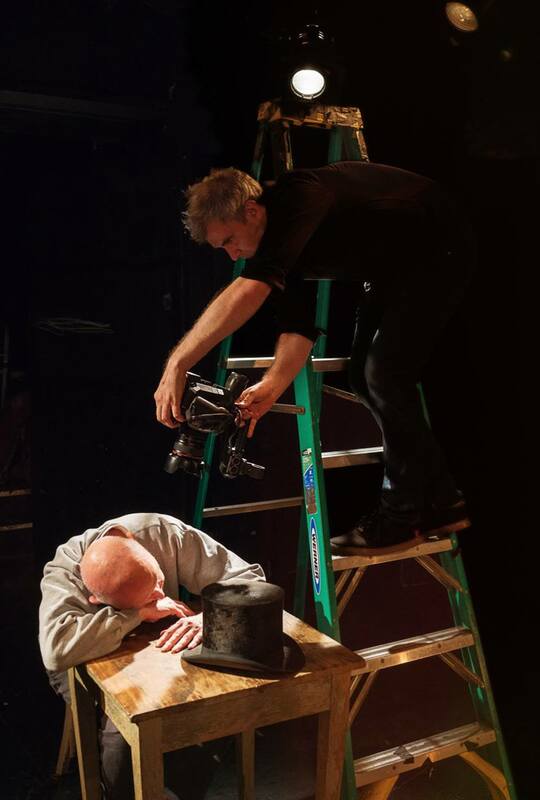 I am happy to announce that I will be premiering my latest video work Scenes at Roulette on September 23rd. It will be accompanied by a live performance by the string trio Dissemble. One year ago I became captivated by the mysterious and hauntingly beautiful drawings of Anna Moser. A few months later we began a collaboration of images and sound that resulted in the following four and half minutes. Anna wrote a really eloquent piece about the process, which is included on the same page as the video. I performed on 8.24.13 some new music set to Apollo 11 footage with my new band Lost Piñata. It was part of the first White Castle Presents in Brooklyn, and I couldn't have asked for a better environment to premiere this new project. Photo taken by Jesse Pietroniro. Here is a still from the latest video shoot. Thorsten Thielow has been an incredible cinematographer to work with. Here is a preview of the video I've been working on most recently. It was shot at Rockaway beach this summer. Here is a preview of the latest video I've been working on. It's the first time I've ventured into choreography, and have been lucky enough to work with a very talented dancer, Kate Stephens. Some postcards that I created are being featured in an exhibition at Exit Art. The exhibit is about hydraulic fracking, and in addition to having a traditional opening they are also presenting a discussion on fracking hosted by actor Mark Ruffalo. The talk is Wednesday, January 12th from 7-9pm and is $5. 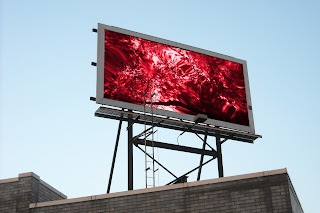 Exit Art is at 475 tenth Avenue at 36th street, Manhattan. 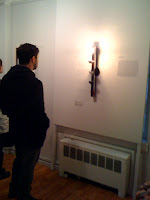 Here are a couple of photos from the opening reception of Call and Response. 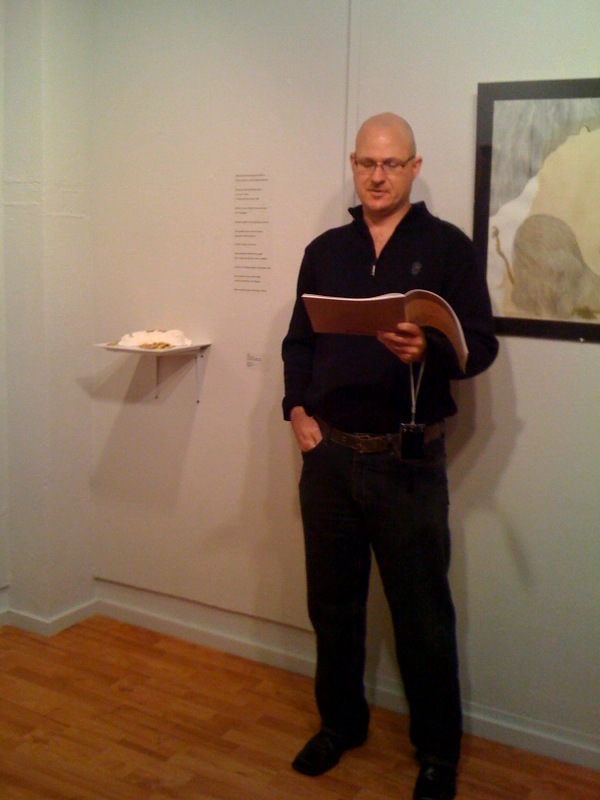 Stephen Lindow is pictured (right) reading a piece he wrote in response to my work ...That Broke the Piggy's Back. The sculpture is on display behind him. Changing a Lightbulb is pictured left. The catalog for the show came out really well, and I'll post more info about it when it becomes available. I've been working on a project that involves writers and visual artists responding to each others work. The exhibition will be at the University of Massachusetts Amherst Herter Gallery. The opening reception will be on Saturday, November 14 from 3 to 5pm, and the show will be up from the 14th through December 10th. I will be showing a couple of new sculptures of mine in a group show at C.C.C. Gallery in Brooklyn. The title of the show is "Little Tragedies", and will be up for the month of June. 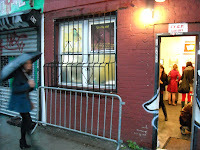 This is a small new gallery in Williamsburg, and the photo I've posted is from the opening. The entrance is on Hope Street. In the studio lately I've been working on a sculpture for my friends at the Miracle Grill in Park Slope. I've also been working on a few projects over at Dieu Donne Papermill. On the Free Music Archive website you can now listen to and download the Pyramid Scheme Trio's concert from last September at Issue Project Room. My show at Galley Satori has been extended to January 15th. If your in the neighborhood check out the other galleries around it too, there's some very cool shows up right now. Thanks goes out to everyone who came out to the opening. I will be showing work in the lower east side of New York this month. Should be a fun show. 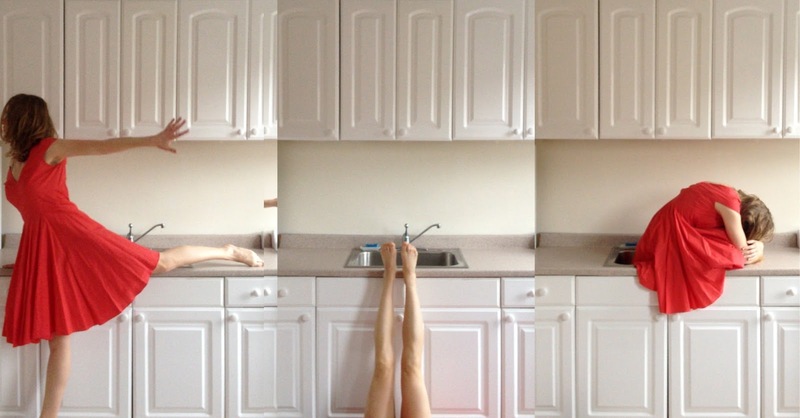 The current shows at Exit Art are both great, and are worth checking out. Having a piece in the exhibit "It's Not Easy" prompted me to go to the opening, and it was big turn out. I also recommend checking out the Buckminster Fuller exhibit at the Whitney Museum. I'll also be playing around a bit in the next few months with my group the Pyramid Scheme. I will be playing with my group the Pyramid Scheme Trio on Friday September 5th at the Issue Project Room in Brooklyn at 8pm. This will be our only show in New York for a while, so if you've been curious what we've been up to come check it out. So the Four Songs for my Countrymen show was a blast. Thanks everyone for coming out. 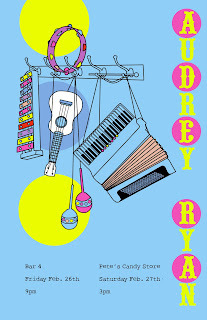 You can check some recordings I did with the Pyramid Scheme Trio here. The photo I'm posting here is from the performance with the group at the opening. In other news, I will be exhibiting work in New York this month at Exit Art. The name of the show is "It's Not Easy", and you can find out more about it here. The opening is Sunday July 24th from 7-10pm. It's a big show, so there should be some cool stuff. Thursday, May 15 from 6:00 pm to 9:00 pm is the opening to my new show titled "Four Songs for My Countrymen". It will be at Hampden gallery at U-Mass Amherst. I will be giving a talk onthe work at 6:00, and there will be a performance by "Pyramid Scheme" at 8:00 of the music I wrote for the show. If you've never been to one I've my exhibits, I'm pretty happy with the way this one came together. I had quite a bit of help from my assistants Ebru Kardan and Andrea Braun, as well as input from musicians J Starpoli and Victor Signore, so a big thanks goes out to all of them. My new group The Pyramid Scheme Trio will be debuting with a performance tonight in Turners Falls Massachusetts. The Phantom Brain Exchange is a very cool event with lots of stuff happing and is worth the drive out there. Wednesday, April 30th, 9pm $5. "Welcome to the Space Jams" 16mm films by Weissbach, Balcom & more. Also thanks for everyone who came out to the Seven Gaits show, despite the weather. I will have pictures posted soon. So here's the latest...I'll be exhibiting in a group show in Southbridge Massachusetts at the Sevengaits Gallery in February. The opening is Thurs. Feb. 7th from 7-11pm. check out sevengaits.com for more info. Plans are underway to for a show at Hampden Gallery in Amherst for May. I will be doing an installation titled Four Songs for my Countrymen . I'll be looking for some volunteers to help install, and do some final prep work, so spread the word. 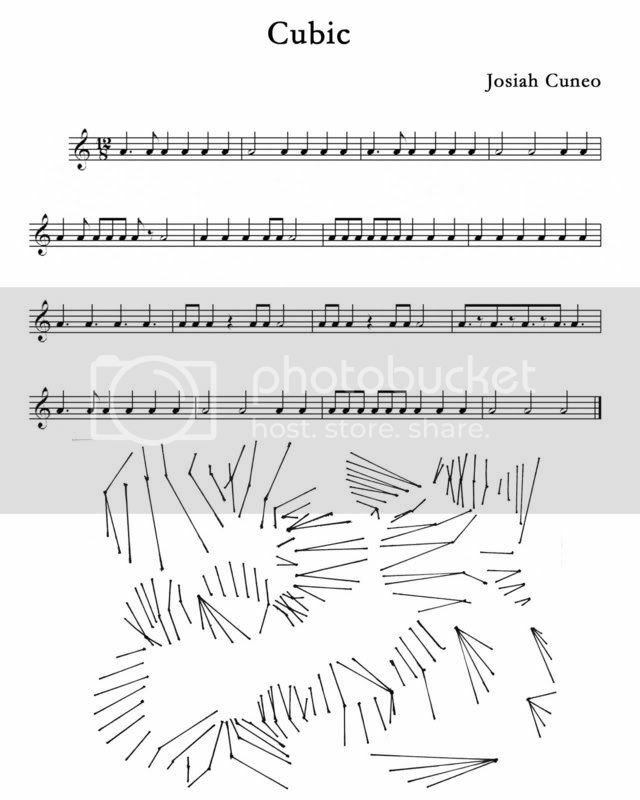 I also just finished a little composition for piano titled Upward and Outward, pictured below. The complete version is on my site, under compositions. Finally, a drum track I did for the song "I Was the First" by Feign Pathos was recently posted at www.myspace.com/feignpathos. 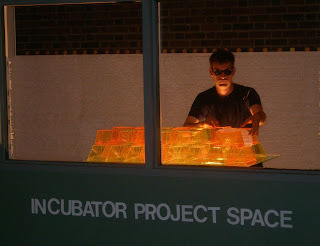 I have finally moved into my new studio in Easthampton. Over the next couple of months I should be kicking it up a notch, and finishing up some more music. 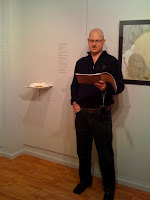 I am currently working on an installation for U-Mass in the spring at the Hampden Gallery. 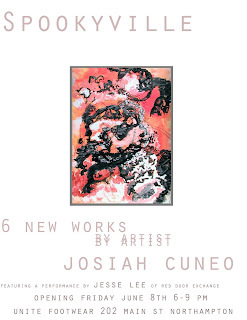 I also have launched my new website at www.josiahcuneo.com . I will be using it as a showroom for the more recent projects I'm working on. Here's two new harmony-free compositions I finished. I currently working on a an animation for Porcilian. 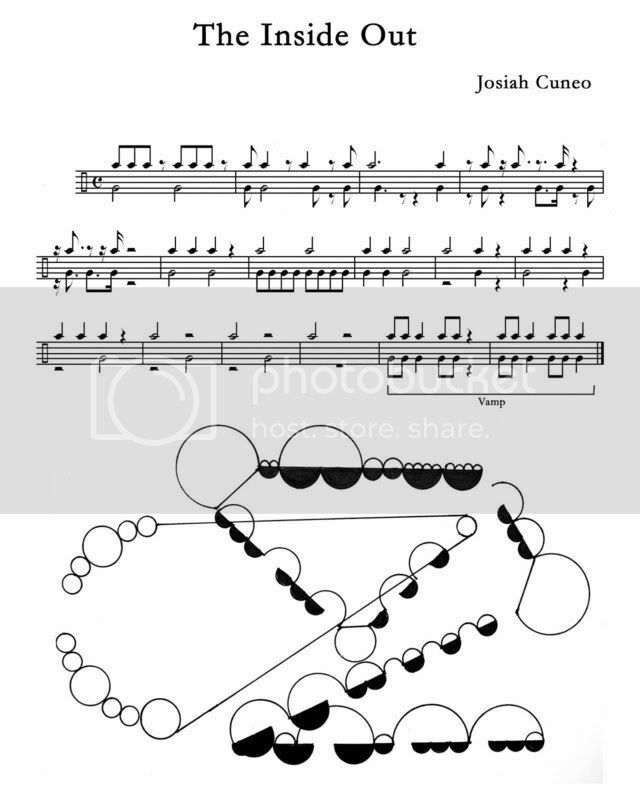 I recently have put together three music compositions. 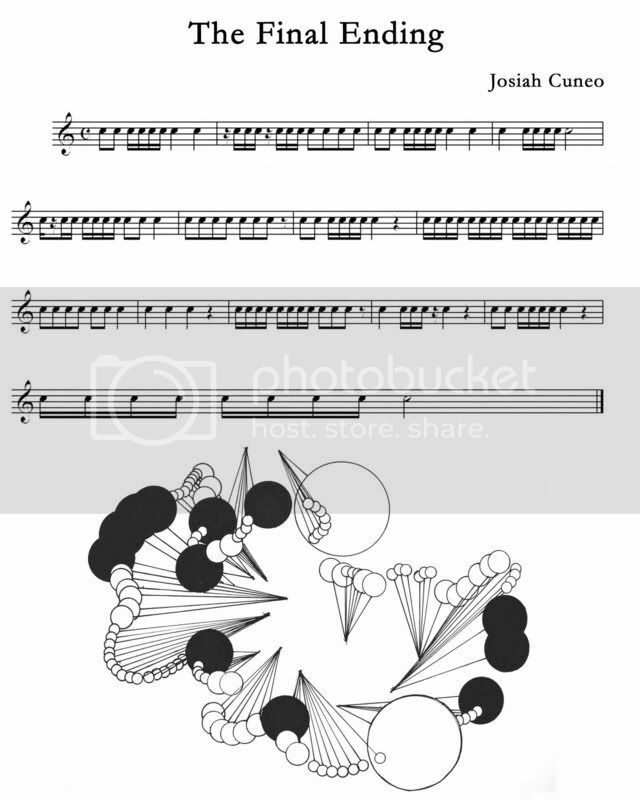 They are really Pre-Compositions, in that they are to be used as a starting point for writing or improvising music. 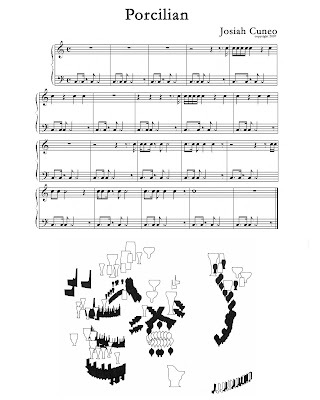 Each is simply short peice that I have written using only rythmic notation. All harmonic decisions is up to the musician. Along with each musical composition I have created a visual image that coresponds with the music. 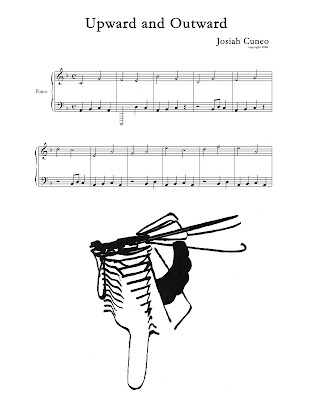 These are rather "literal" translations in the sense that all of the information in the score is represented in the image. 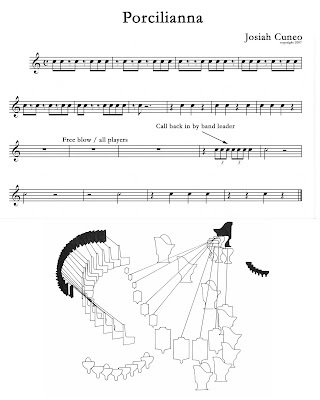 After becoming familiar with the music, I have found that is not that difficult to use that image as a way to "read" the music.